This Volume will be made available with the help of Akita Rescue Of Western New York, Inc.
ARWNY has graciously stepped up to make sure everyone will be able to purchase this one of a kind collection. They are making it available on a CD/DVD Format. All files contained within this CD will be accessible using Adobe Acrobat Reader. 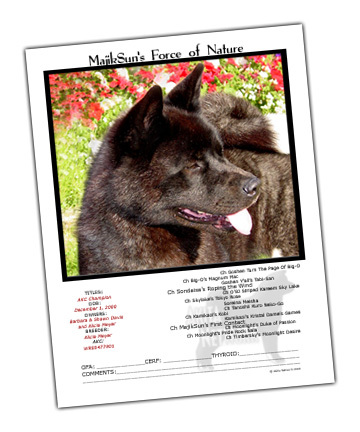 Each CD will contain approximately 270 pedigrees, color photos and registration/title information in Volume I. Each CD will be labeled with a Serial Number for future reference. You will need this Serial Number to purchase Volume II. ARWNY has agreed by all terms: All proceeds from this collection are guaranteed to benefit Rescue & Health! O n S a l e N o w ! -The Akita Network is not responsible for any damages, sales issues or shipping problems that may occur. -Absolutely NO REFUNDS will be offered after purchase - under any circumstances! -If a CD is damaged, you may ONLY exchange it for a duplicate (same serial number). -Prices may change without notice - The Advertised Price is only an introductory price. -Copying or reproducing this disk is prohibited by copyright law, all monies are to benefit rescue situations & health research. Brought to you by ARWNY, Inc.